Were you or a loved one hurt in a hit-and-run accident in Louisiana? Legal counsel is free unless you obtain a successful verdict or settlement, so there is no harm in exploring your options. It takes someone with determination and extensive local connections to conduct the sort of thorough investigation that turns up reckless and negligent motorists who think they are above the law and can get away from it all. Personal injury attorney Bart Bernard has devoted his practice to protecting the rights of the innocent. Over the past two decades he has successfully litigated numerous hit and run injury claims throughout Louisiana, helping his clients recoup significant compensation for their losses. The legal definition of a hit and run is: “the intentional failure of the driver of a vehicle involved in or causing an accident to stop such vehicle at the scene of the accident, to give his identity, and to render reasonable aid.” Drivers involved in an accident that has caused property or physical harm must give name, address and license number to the victim or to the police. For hit-and-run offenders: The consequences for a hit-and-run accident vary from state to state, but the crime can be classified as a misdemeanor or a felony in Louisiana. A misdemeanor hit-and-run offense can lead to a maximum fine of $500 and imprisonment ranging from 10 days to six months. The penalty for a felony hit-and-run – in cases of severe bodily injury or fatality — is a fine of up to $5,000 and a jail sentence up to 10 years. Offenders are subject to license suspension and probation upon release, not to mention increases to their auto insurance or outright cancellation. Drivers with prior offenses or willful concealment of the crime can see enhanced jail sentences ranging from five to 20 years. For victims of hit-and-run: Of course, the consequences for victims are far worse. They suffer injuries like broken bones, organ perforation, nerve damage causing permanent disability, disfiguring burns and scars, spinal cord damage, traumatic brain injuries, and psychological issues ranging from post-traumatic stress disorder (PTSD) to depression. The life-altering financial losses alone are enough to cripple a person. Write down any information you can recall – including the model, make and license number of the vehicle; a physical description of the driver; the date, time and location; and which direction you were traveling. Before leaving the scene, get a few photographs if you can and take photos of vehicle or property damage and physical injuries. Look for any eyewitnesses who could provide testimony. Call the police to formally report the accident. Ideally, you should report the incident to the police within 24 hours. Exceptions can be made in cases where the victim was too badly injured to speak with the authorities. Having a police report can also expedite proceedings with insurance providers. Call your auto insurance provider. Insurers may give you a hard time about letting you tap your uninsured motorist coverage to pay for medical expenses and vehicle repairs. They sometimes argue that you “should have made reasonable attempts to obtain identifying information” about the perpetrator’s vehicle. Call an attorney. Even if your insurance does pick up the tab for the accident, it is unlikely all your bills will be covered. The financial aspect is just one part of moving on with life. Most accident victims want retribution – not just to heal some of the emotional wounds – but to see that justice is served and there is one fewer negligent driver on the road. Who is Liable for a Hit & Run? Party hosts: Did someone force the driver to consume alcohol unknowingly or against his/her will? Unlike most states, Louisiana has not enacted strict “dram shop” laws that allow injured persons to go after an alcohol vendor or social host if a hit-and-run driver has been drinking or using drugs. Local municipalities: Did unsafe road conditions and maintenance contribute to the accident? Were there known issues with a blind turn or a malfunctioning signal? Motor vehicle manufacturers or maintenance personnel: Did the driver’s vehicle malfunction in some way? Did maintenance personnel make an error that led to the driver unknowingly operating an unsafe vehicle? Commercial entities: Was the driver working for a company at the time of the accident that had overscheduled, administered improper training, or overlooked a history of safety violations? We don’t make excuses for hit-and-run drivers. The person who actually hit you and failed to stop and render aid at the scene is always the primary defendant. There are, however, many possible angles that arise during hit-and-run investigations; so it’s best to contact a Louisiana car accident lawyer who will conduct a very thorough search into all the contributing factors of the accident once the perpetrator has been caught. There is no guarantee or “average” hit-and-run settlement amount. Each case is judged on its own unique merits. Severity of injuries sustained – with fractured bones, lifelong disabilities and deaths seeing maximum payouts; the amount of time missed from work and the extent of your treatments are taken into consideration; preexisting conditions could diminish your settlement. Fault – with innocent victims who were not in any way liable carrying the most weight; the more evidence there is against the other driver, the more money you are likely to see, which is why hiring your own investigative team is crucial to securing a fair settlement. Pain and suffering – which is sometimes estimated by your medical bills multiplied by three. Pain and suffering can be calculated for more than one plaintiff if there are multiple children and a spouse. Pedestrians suffer some of the worst outcomes in hit-and-run accidents. One in five pedestrian fatalities is caused by hit and run drivers, according to the National Highway Traffic Safety Administration. Pedestrian hit-and-run settlements have all the same factors of any hit-and-run crime, but may have higher amounts to cover: funeral and burial expenses, pain and suffering, loss of guidance and emotional support for dependents, as well as loss of income and lost companionship for a spouse. When Should I Contact a Hit and Run Lawyer? The ideal situation is to contact a lawyer immediately following your accident. Even if you think your injuries are minor in nature — which is often the case with soft tissue neck and back injuries –it’s always wise to seek legal representation. Louisiana has a two-year statute of limitations for filing personal injury lawsuits. You have from two years to file from the time you became aware of the extent of your injuries – not necessarily from the date of the accident itself. 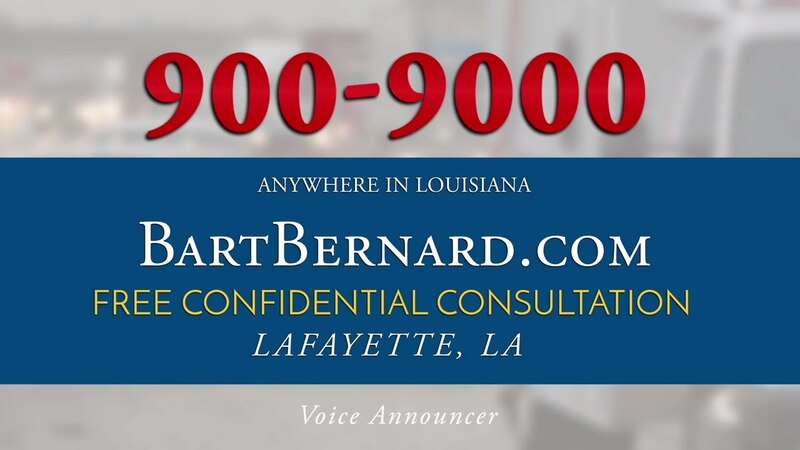 Bart Bernard understands Louisiana law and has a proven track record of winning tough motor vehicle accident cases. Call (337) 989-2278 to schedule a free case review today.